but the city tries to make the most of this happenstance. 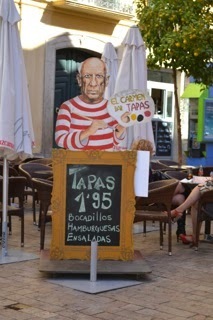 The museums in Malaga obviously do not house Picasso’s best works and we found the interactive museum of musical instruments much more interesting. 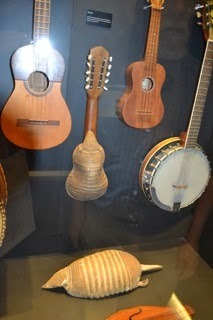 This picture shows a percussion and stringed instrument made from an armadillo. Gibraltar is unique, almost magical. It is a self-governing territory in the English Commonwealth, only 2.6 square miles in area and home to only 30,00 people. Spain wants to possess this strategic entrance point to the Mediterranean, but the people of Gibraltar, many of Spanish descent (although their origins are international) vote heavily to maintain their independence. 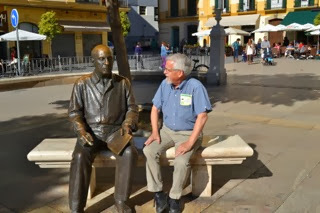 We took a bus tour from Málaga that wound through the beautiful beach towns of the Costa del Sol. When we arrived at Gibraltar, the queue to get in was two hours long, so our guide told us we should disembark from the bus and walk in, as there would be no delay that way. 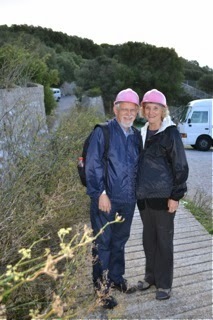 Since the airport lies between Spain and Gibraltar we would just have to walk “through the airport,” he said. I assumed he meant the airport terminal, but, no, we walked on a wide pedestrian path, beside a road, right across the runways. A loud klaxon sounded after we passed and all vehicles and pedestrians stayed on the sidelines while a plane landed. We visited a ginormous cave (yes, that word is in the dictionary—and appropriate here) full of stalactites and stalagmites that has been converted into a theater. 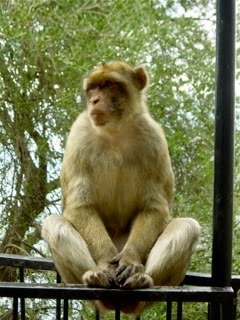 We frolicked with the Barbary macaques as they came up and pulled on our trousers, their way of asking for food. 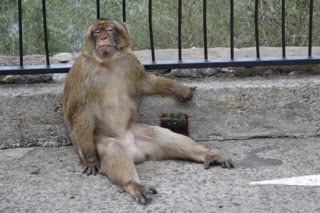 The law prohibits feeding them and the fine is steep (£ 4,000), but the government cares for them, as there is a belief that the British will hold Gibraltar as long as the monkeys (an African breed) remain on the rock. For the better part of the twentieth century the military used to care for them, tracking them officially, naming them after famous British figures, and caring for them in the military hospital when ill. The military also built 34 miles of tunnels inside Gibraltar during World War II, which held 16,000 troops and a store of food to last for more than a year. You can see Africa, the home of the monkeys, from Gibraltar! I don’t know why that was so exciting, but I felt like a child who had just seen a fairy!